Writing an SOP for Continuous Improvement | Writing Assistance, Inc.
Standard Operation Procedures, or SOPs as they are commonly known, are snapshots of a company’s life force, which is always in a state of flux and change. When they are well-written, they become one of the best tools for making improvement decisions. What Makes for a Well-Written SOP? 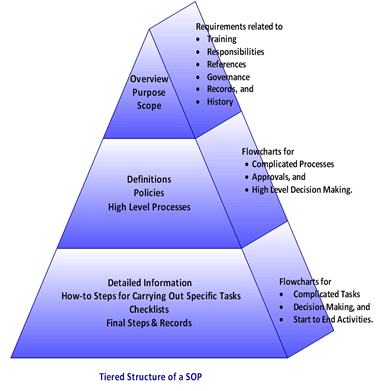 A well-written SOP will be structured in three tiers of information as shown in the figure to the right. Before anyone starts using the SOP, you want to ensure that they will be able to understand and utilize the instructions correctly. Allowing employees to learn as they go, which means learning by making mistakes, can be very costly to a company and even put it out of business. State upfront the pre-requisites and qualifications necessary for using the SOP. Things sometimes are left undone when employees are unclear who is responsible for carrying out certain activities. Who hasn’t heard the excuses? “It’s not my job. I thought so-and-so was supposed to do that. That’s our responsibility?” Eliminate blaming and squabbling by having responsibilities stated in black-and-white. Defining responsibilities also means people can readily determine who the go-to person is when they have questions. This reduces the chances of errors, gives employees confidence, instills pride, and expedites work. SOPs are almost always tied in with something else. Departments have activities unique to their functions, and these activities may each require one or more SOPs. Employees must answer to their departments as well as to the company policies that apply to all workers. The company, in turn, has outside requirements driving it. By providing references to the standards or regulations that apply to a SOP, internal or external, compliance becomes easier. As a company grows, corporate level policies typically begin to develop with the nitty-gritty details being left to the lower levels. Corporate has the bigger picture and establishes the larger goals that the company is striving to obtain. If a liability issue arises, records show that the company did everything correctly and as intended. For everyday operations, records tell which tasks have been completed, when, by whom, and what needs to be done next. List the records involved with the SOP to eliminate the need to track down information. Rather than wondering how did we ever reach this point, a SOP’s history shows how the processes evolved and what the thinking was when certain decisions were made. There is a symbiotic connection of making sure that everyone is working in unison and that nobody is doing something that will undermine or negatively impact the other. The well-written SOP helps to ensure that all is in synch. The second tier of a well-written SOP switches the focus onto activities covered by the SOP. The SOP’s middle section should define words, terms, or acronyms that may not be understood by all or may have multiple meanings. Any policies specific to the SOP should be pulled together in one location. Policies, like responsibilities, are an area where employees may have strong differences of opinion. Collecting policies together in writing eliminates headaches. If the policies change, update the SOP. The next component of the middle tier is the processes. Managers in particular just want to know the basics, i.e., what are the main stages? What starts it, what happens, and what ends it? Managers are the decision makers so create flowcharts that show the decision rules. Do not forget to include what happens if something does not go as planned. Details are not necessary; the reader simply needs to be pointed in the right direction when faced with a situation not covered by the SOP. Depending on the industry, actions made be required to identify and contain non-conformances or reports must be made within a certain time period. Flowcharts permit the eye to quickly identify the major stages of the processes when fast reminders are being sought. Keep things brief. The person using the SOP may not be the one carrying out the specific tasks. The second tier provides the reader with information of what is involved and sets the stage for the detailed information that comes next. The third or bottom tier provides the in-depth information. Consequently, it will be the largest section of the SOP. Whereas the second tier explained the stages, the third tier gives the tasks involved with each stage as well as the step-by-step instructions carrying out each task. Sometimes illustrations and/or screenshots are included. If liability risks are involved and it is critical that all the steps are performed, records are necessary. Checklists serve both as reminders and records. Set them up in progressive order. Consider the checklists as the primary records that will be audited. Make sure they contain “the who, what, when, where, and why” that auditors look for. “The how” is spelled out in the SOP. Third tier information sometimes utilizes information not contained in the SOP. For example, if one of the tasks is to perform a certain test, the test method is cited, but the test instructions are found elsewhere, such as in a test manual. The required test results are almost never contained in the test method itself since the test method is how the test is performed. The company, an outside agency, or a customer will specify what test results are required. Those specifications are usually grouped with others. Therefore, the exact ones to use must be cited with enough information as to where to obtain them and which specifications apply under which circumstances. As with the second tier, flowcharts provide the user with a quick visual of what is happening and the decision points. Once a company has established a baseline of what it is doing via the draft SOP, the SOP is then examined for any gaps in policies, procedures, steps, equipment, or understanding. The SOP is then tweaked and refined into something that is finally approved for use. Once a year (or sooner if there is a major change, issue, or problem,) internal auditors use the SOP to determine if employees are performing the tasks as stated previously. If not, then investigation is done to determine why. Audit findings may uncover redundancy or obsolete methods. Audits may highlight risk areas that need to be addressed. Sometimes the SOP is still current and valid, but retraining is needed, or over the course of the year, changes have been made somewhere and now the SOP needs to be updated, revised, or replaced. where money is being wasted. Knowing the above eliminates guesswork. A well-documented SOP means the company can identify which improvements make the best sense and which will give the best ROI. The well-written SOP is one of the best tools for keeping abreast with change and thus, it is truly critical for continuous improvement.